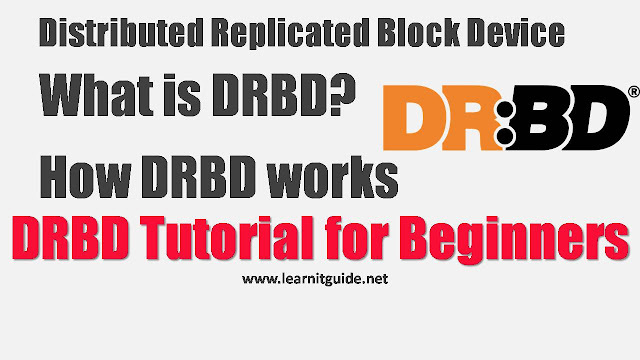 This post explains you about the DRBD (Distributed Replicated Block Device) to understand What is DRBD (Distributed Replicated Block Device), How the DRBD Works, DRBD Operations, DRBD Replications modes, DRBD Architecture and DRBD Administration commands. DRBD stands for Distributed Replicated Block Device. DRBD is a great thing to increase the availability of our data. It is a Linux-based opensource software component that facilitates the replacement of shared storage systems by networked mirroring. In short, we can say this as "Network based Raid 1 mirroring for the data". So it can be used to mirror the filesystems, VM Images and other block devices stuffs across the network. 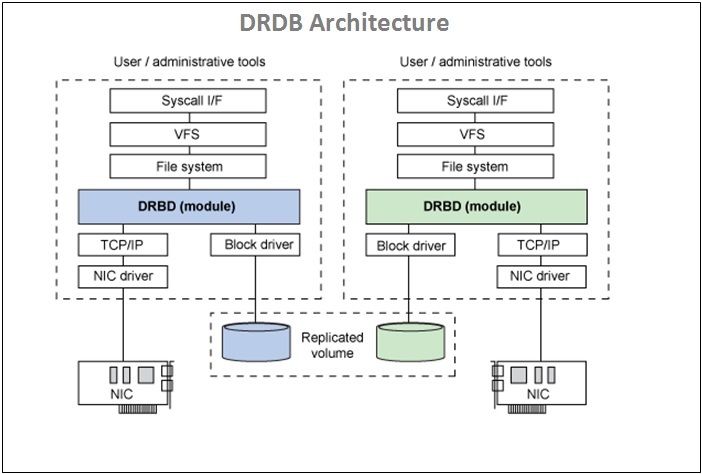 Overview of DRBD in the context of two independent servers that provide independent storage resources. One of the servers is commonly defined as the primary and the other one is secondary server. The DRBD software provides synchronization between the primary and secondary servers for user-based Read and Write operations as well as other synchronization operations. The most commonly used Data synchronization mode is Active-passive. In the Active/Passive mode, the primary node is used for Read and Write operations for all users. The secondary node is promoted to primary if the clustering solution detects that the primary node is down. Write operations starts at primary node and are performed to the local storage and secondary storage simultaneously. DRBD supports two modes for Write operations called fully synchronous and asynchronous. DRBD can also support the active/active mode, Which means Read and Write operations can occur at both servers simultaneously. This mode relies on a shared-disk file system, such as the Global File System (GFS) or the Oracle Cluster File System version 2 (OCFS2), which includes distributed lock-management capabilities. 1. Protocol A - Asynchronous replication protocol. Local write operations on the primary node are considered completed as soon as the local disk write has finished, and the replication packet has been placed in the local TCP send buffer. In the event of forced fail-over, data loss may occur. 2. 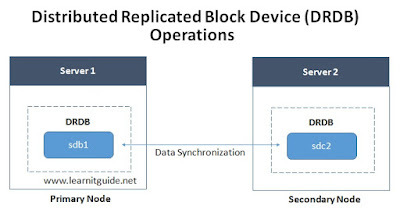 Protocol B - Memory synchronous (semi-synchronous) replication protocol. Local write operations on the primary node are considered completed as soon as the local disk write has occurred, and the replication packet has reached the peer node. Normally, no writes are lost in case of forced fail-over. 3. Protocol C - Synchronous replication protocol. Local write operations on the primary node are considered completed only after both the local and the remote disk write have been confirmed. As a result, loss of a single node is guaranteed not to lead to any data loss. Most commonly used replication protocol in DRBD setup is Protocol C.
DRBD is split into two independent pieces: a kernel module that implements the DRBD behaviours and a set of user-space administration applications used to manage the DRBD disks. 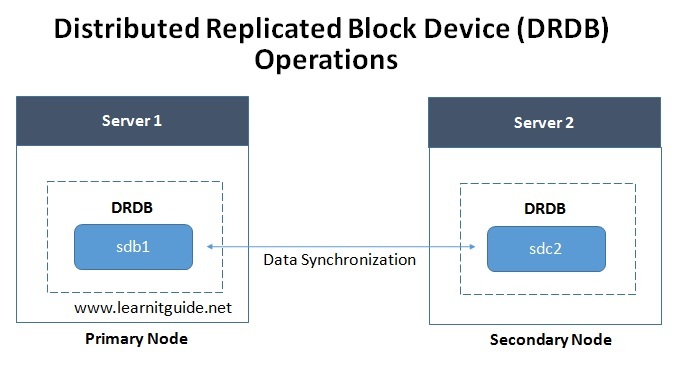 The kernel module implements a driver for a virtual block device (which is replicated between a local disk and a remote disk across the network). As a virtual disk, DRBD provides a flexible model that a variety of applications can use (from file systems to other applications that can rely on a raw disk, such as a database). The DRBD module implements an interface not only to the underlying block driver (as defined by the disk configuration item in drbd.conf) but also the networking stack (whose endpoint is defined by an IP address and port number, also in drbd.conf). DRBDadm - High level Administration tool. DRBDsetup - Configures the DRBD module that was loaded into the kernel. /etc/drbd.d/global_common.conf - contains the global and common sections of the DRBD configuration.